This is the first post in my new series 10x, where I share my experiences and how we do things at Clay.io to develop at scale with a small team. CloudFlare handles all of our DNS, and acts as a distributed caching proxy with some additional DDOS protection features. It also handles SSL. We use Amazon S3 as our CDN backend, which hosts all of our static content. We use a separate domain for this: cdn.wtf for security and performance reasons (cookie-less domain). HAProxy is an extremely performant reverse-proxy which we use to route traffic to our different services. This work is non-trivial due to the nature of Clay.io and its platform support concerns (and legacy code support), which I will go into detail in a later article. We currently have a single HAProxy server on an m3.medium instance, but will upgrade as traffic increases. In addition, we may add Amazon ELB in front to scale horizontally if necessary. Docker is tool to manage Linux containers, which are similar to Virtual Machines except with less overhead (and without some isolation and security guarantees). The key to Docker is that code shipped inside of a container should run the same no matter what the host machine looks like. 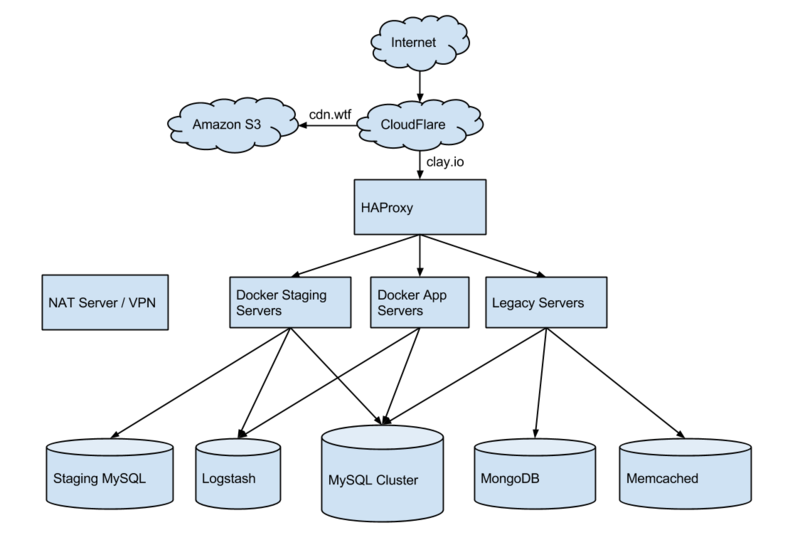 Our staging environment server is identical to our application server, and runs the exact same docker binaries that we run in production. This environment has been critical to preventing unnecessary breakage and downtime of our production systems. MySQL is a production-hardened relational SQL database. The vast majority of our data currently resides inside a Master-Slave MySQL cluster. We have one master, and two slave servers which serve most of our queries for our users. Eventually we may have to move tables or shard the single master server, but hopefully not for a while. Logstash is a log aggregation tool, with Kibana integration for analysis. It basically handles all of our application logs, and gives us a place to check for errors when something goes wrong. It saves us from having to SSH into a machine to check logs. MongoDB is a NoSQL document storage database. We currently use mongodb for some of our developer endpoints, and for our A/B testing framework Flak Cannon. Memcached is a key-value store, used mostly for caching. In many ways it is similar to Redis. We currently use Memcached in our legacy webapp for caching MySQL query results. Eventually we would like to replace this with Redis. Ansible has been our tool of choice for managing our servers. It's simple enough for most developers to learn quickly and be comfortable working with, and has been critical for automating many of the processes normally managed by an operations team. GitHub - Great source code management, enough said. Uptime Robot is a free monitoring service which we use to monitor our healthchecks and endpoints. If anything goes down, it will email and text message us within 5min. Drone.io is a continuous integration service, which we use to continuously run our test suites for our various projects. It is similar to TravisCI, and has recently released an open source self-hostable version. We currently use the official Docker registry to manage our docker containers. It's similar to GitHub, except for Docker containers. Google Analytics is our main website analytics tracking tool. For tracking our site specific features, we use the custom events features. Google Apps provides email for our domain clay.io, and gives our organization a shared Google Drive setup. Last Pass is a password management service which allows us to share company credentials for all of the other above services easily amongst the team. While we are currently happy with our setup today, we hope to improve it in the coming months. This initial infrastructure version is missing some features which weren't necessary enough to justify spending time on, but we will eventually need to come back to them as we scale. Kubernetes is looking to be an amazing project and tool for managing Docker containers at scale. We will be following it's development closely and hopefully put it into production as the project matures. Amazon Glacier is another technology we have been looking at for doing database backups, and hope to implement that in the near future. RethinkDB, while quite immature, is also quite an interesting project. We will definitely be following it's progress and may eventually move some of our data into it as we move away from MySQL.